I've been doing business in San Antonio for quite a while, I've written articles about how important a good team is to in your success as an investor, and as a company seen over 300 rehabs in the two or so years that we've been operating in San Antonio from start to finish. Today I'm here to show you what an awesome contractor can do for you and give you an idea of some numbers. Jim McAuliff has been a good friend of mine for the last two years and does excellent work on rehabs, and for some of the best prices in town. This was a project that he completed. 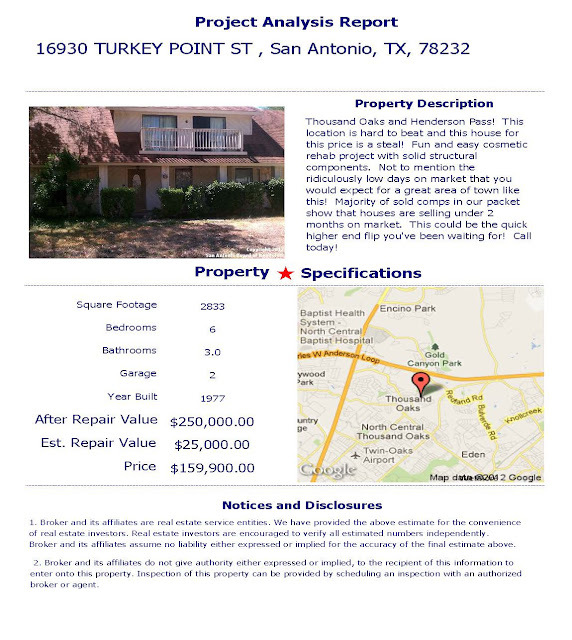 16930 Turkey Point, San Antonio, TX 78232 was a property that my partner Saad Khan and I sold to an investor in New York, NY. Compare the before and after pictures of this house! This house sold in 38 days to a cash buyer for exactly $248,000. During the course of the rehab she wound up putting slightly more into the project than we had projected. Her reasoning behind this was to create such an amazing aesthetic appeal that it wouldn't sit on the market for the projected 60-90 days. The aftercare program is additionally similarly imperative as the primary treatment and thus it can't be disregarded.